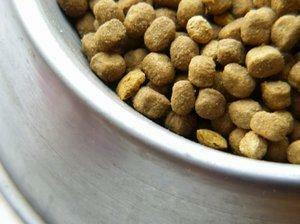 What kibble is best for your dog? Dog food recipes offer pet lovers a wonderful opportunity to prepare food for their furry friends that is wholesome and free from harmful additives. Although it can be difficult to maintain the perfect balance of nutrients when cooking at home, these healthy recipes are a nice, occasional alternative to commercially prepared foods and treats. 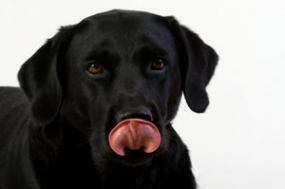 Cooking for your dog on a regular basis can be a challenge, so make sure it's a labor of love, and not just a labor. Keep some high quality kibble on hand for times when you don't feel like cooking as well as to make sure your pet receives a balanced diet overall. You can also make multiple home cooked batches when you do feel in the mood to cook and save them in your freezer in meal-size portioned freezer bags. Note: Making kibble takes practice. You may find you need to adjust the amount of flour or liquid to reach the ideal spreading consistency. Baking times can also vary, but it's important to let the kibble remain in the oven after you turn it off so it will continue to dry and become nice and crunchy. Combine first six dry ingredients in a large mixing bowl. Stir together next four wet ingredients and then mix well with the dry ingredients. Work in the ground meat, making sure to disperse it well. Divide the dough in half and spread it out about 1/2-inch thick on two greased cookie sheets. Cut it with a knife or pizza cutter into a small checkerboard pattern in whatever size you want your finished kibble to be. Bake until uniformly golden brown, approximately 50 minutes. Remove from oven, allow to cool for ten minutes, and then use a spatula to break the squares apart. Stir them around slightly and return to oven. Turn off oven, leave the kibble trays inside and allow kibble to remain drying as the oven cools. Stir occasionally to check consistency. You want it to be dry and crunchy when finished because this will also help preserve it for up to two weeks. Store in an airtight container, or portion into freezer bags and store for up to two months. Dogs love a warm and hearty meal, and this meat and veggie loaf is sure to become a favorite with your pet. Using your hands, mix all ingredients thoroughly in a large mixing bowl. Make sure everything is well combined. Divide mixture into three equal portions or "loaves." If you have a small dog, you can divide into six mini loaves. Arrange in a greased baking dish and bake in the oven for one hour or until the individual loaves reach an internal temperature of 160 degrees F. Remove from oven. You can serve a portion immediately once it's cool enough for your pet. Allow remaining portions to cool completely, bag them in individual freezer bags and keep in the freezer for up to four weeks. If you enjoy preparing these dog food recipes for your dog, be sure to check out the following articles for more recipe ideas. You may not always feel like cooking for your dog, but it's good to have a lot of ideas on hand.